The Pink Hope. A lower alcohol cocktail for a great cause! I am honored that I was recently chosen as one of eight female finalists from across the country to compete in Rhuby Liqueurs NY Pink Your Drink Competition that was held at The Dead Rabbit right here in New York City. I created the cocktail The Pink Hope for the competition. I also wanted to come up with a cocktail that was lower in alcohol . Many female customers ask me for a low alcohol cocktail that isn't to strong or boozy but still tastes great. I use Rhuby Rhubarb Liqueur which is an artisinal Rhubarb liqueur from Sweden, Pavan Liqueur which is a muscat liqueur flavored with orange blossom from France, Fee Brothers Cherry Bitters and some fresh lemon. 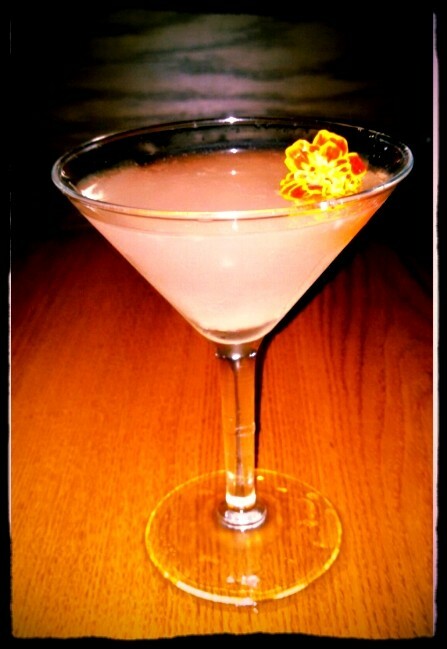 I also garnish it with a pretty edible flower. Barramundi is donating $1.00 from the sale of each Pink Hope to The Breast Cancer Research Foundation. Many bars and restaurants donate for the month of October but we are continuously donating all year round.